Competitive swimming has existed since the 19th century and possibly for many centuries before that, according to the Federation Internationale de Natation, or FINA, the governing body for international competitive swimming. Men and women have continued to record faster swimming times as competitive swimming grows more popular around the world. The archive of "The Times" of England contains reports of an 1844 race between Englishman Harold Kenworthy and two Native Americans named Flying Gull and Tobacco. The visitors from North America swam in a way that the anonymous "Times" writer described as "totally un-European," according to FINA.org. The stroke seems to have resembled modern freestyle. The Englishman lost the race swimming the breaststroke. In the 1840s, the sidestroke surpassed the breaststroke as the most popular racing stroke in England, according to FINA.org. In 1873, John Trugeon combined a freestyle-like arm motion with the breaststroke kick. 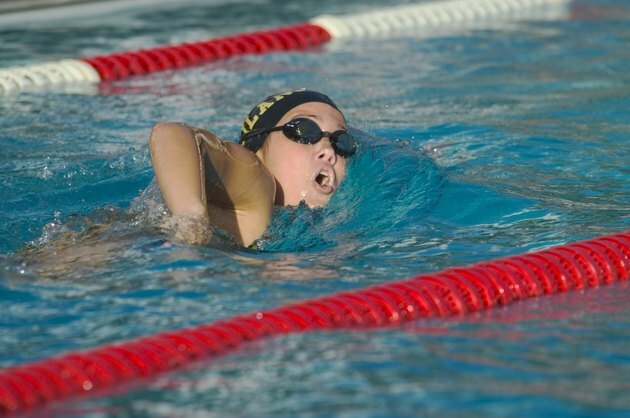 This stroke became popular for short races. After observing natives in Australia swimming in a style similar to that of the Native American Flying Gull, Englishman Fred Cavill began to practice the freestyle, teaching it to his sons. His son Richard Cavill won a race with this stroke, and described the swimming style as a way of "crawling" through the water, according to FINA.org. Thus the stroke became known as the front crawl. England's National Swimming Society, which dated to the 1840s, became the Swimming Association of Great Britain in 1874, according to FINA.org. In 1886, this association joined with the Otter Swimming Club of London to form the Amateur Swimming Association. This organization remains the governing body for the sport of swimming in England today. Germany formed its first swimming federations in 1882, followed by France in 1890 and Hungary in 1896. While the English swimming organizations paid little attention to rules standardization and timing in the 19th century, Australians began to hold regular championship races. In 1846, William Redman won the 440-yard freestyle championship with a time of 8:43, according to FINA.org. Australia began to hold regular championships in 1889. The United States held its first national championship in 1877, and Scotland held the world's first women's swimming championship in 1892. Alfred Hajos became the first Olympic swimming champion at the 1896 Athens Olympics. FINA was established in 1908, and for the next six decades, the Olympic Games remained the only international competitive swimming event. From 1908 to 1956, men swam only the freestyle, backstroke and breaststroke. Women swam only the freestyle at the Olympics until 1924, when FINA added backstroke and breaststroke events. In 1952, FINA decided to add butterfly events to both the men's and women's competitions. FINA also introduced medley relay events to competition. As of 2010, men and women swim the same number of events at the Olympics, including four freestyle races, two backstroke races, two breaststroke races, two butterfly races, two individual medleys, two freestyle team races and one team medley race. What Is the History of Track and Field Hurdles?